Walt Disney was such a train fanatic that he had a railroad built in his own backyard. It was a 1/8 scale train with a custom-built steam-powered locomotive. Walt named it the Carolwood Pacific Railroad. He wanted to share his love for trains on a grander scale. And that dream eventually led to the Walt Disney World Railroad at Magic Kingdom. Guests can board or disembark at three different train stations—at Main Street U.S.A., at Frontierland and at Fantasyland. No matter which station you choose, you’re in for a beautiful scenic 1.4-mile tour around the Magic Kingdom. There are four Walt Disney World Railroad locomotives, and three are currently in service. The “Walter E. Disney” has a red cab with a red boiler jacket with coaches that are red with red poles. It was built in 1925. The “Lilly Belle” was named for Walt’s wife, Lillian, and was built the same year Mickey Mouse was created—1928. She has a green cab with a green boiler jacket, and her coaches are green with green poles. The “Roger E. Broggie” was named after the man responsible for acquiring the locomotives for use on Disney World’s Railroad. 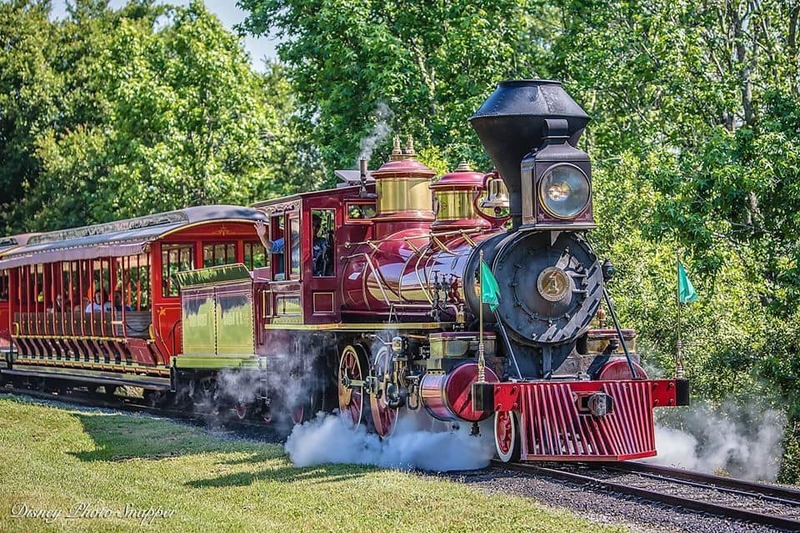 The locomotive was built in 1925 and has a red cab with a green boiler jacket. Its coaches are yellow with red poles. There is also a locomotive named for Walt’s brother and business partner, the “Roy O. Disney.” This classic attraction hasn’t changed over the years, and when you experience it, you feel a bit of Walt nostalgia as well, which makes it even more memorable.